Home Tags Posts tagged with "street protests"
Anti-Mohamed Morsi protesters have clashed with police outside the presidential palace in Cairo, after a week of violence in which more than 60 people were killed. Riot police used tear gas and water cannon to try to drive back the crowds throwing rocks and petrol bombs. Thousands also rallied in Port Said – one year after football riots in the city, which killed 74 people. The protesters accuse Islamist President Mohamed Morsi of betraying the 2011 uprising – a claim he denies. In a statement on his Facebook page, Mohamed Morsi warned that security forces would “act with utmost decisiveness” to protect state institutions and those groups behind the violence would be held “politically accountable”. Mohamed Morsi’s supporters say the demonstrators are trying to used the power of the street to bring down the country’s first democratically elected president. On Friday, thousands of people chanted “Leave, leave, Morsi!” as they gathered outside the presidential palace – in the north of the capital. Some of the demonstrators then began throwing Molotov cocktails over the palace walls and lighting fires in the streets. Skirmishes were reported close to the capital’s Tahrir Square, where thousands more marched, urging Mohamed Morsi to leave. A demonstration was also held in Port Said, at the northern end of the Suez Canal. The city has seen the worst of the violence over the past week, in clashes sparked by death sentences imposed on 21 local people in connection with the football riots. 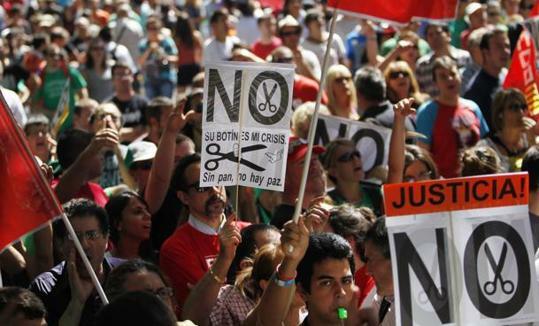 On Thursday, leaders of some of the main political factions condemned the violence. But youth groups later still called for more street protests. In a separate development, human rights officials have expressed alarm over a rise in sexual violence against women in Cairo. According to the UN’s Office of the High Commissioner for Human Rights, 25 women have been sexually assaulted, mainly in Tahrir Square, since the protests erupted. Michelle Bachelet, of the UN’s Entity for Gender Equality and the Empowerment of Women, said she was “deeply disturbed by the gravity of [the] recent attacks”. Sexual assaults against women around Tahrir Square was widely reported during the uprising there which eventually unseated Hosni Mubarak. 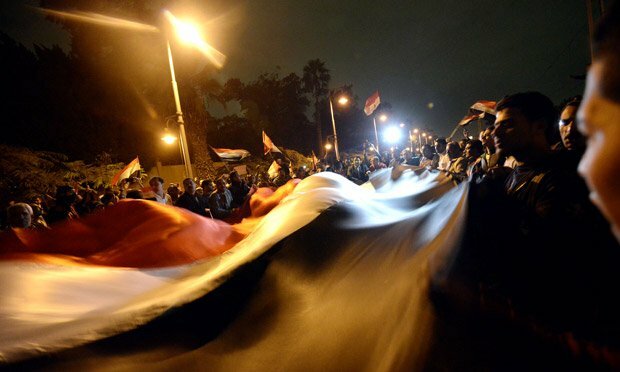 The current unrest began on January 24 in Cairo on the eve of the second anniversary of the revolution and has spread to several cities. Protesters accuse President Mohamed Morsi, a member of the Islamist Muslim Brotherhood, of imposing a new form of authoritarianism and betraying the values of their uprising two years ago. On Tuesday, Egyptian army chief General Abdul Fattah al-Sisi warned that the political crisis could lead to the collapse of the state.